If you’re not quite ready to grasp the total concept of winter, ease yourself into it gently, via autumn 2015’s most practical fashion trend: the long cardigan. You’ll basically be owning a knit or similar that is part sweater, part coat, and a little bit bohemian. You can style your whole outfit around it, and the best thing about it is that it’s made for layering. That’s your best friend at any time, but when the weather is unpredictable, or you’re hopping between extremes of temperature, it’s your pal for life (well, for some time, anyway). You can acquire this new BFF in flimsy fabric, pulled in with a narrow belt, or you can flirt with lace or mesh that floats impeccably. A bralet would look just stunning underneath, and you could balance the whole with a fedora and outsize bag. On another day, it might appear in chunky wool, in which case you can cinch your waist with a thicker belt. Alternatively, leave it open to flaunt the contrast beneath, in the form of a mini or shorts, and a crop top. Get poncho style with short sleeves, or be street wise with a plaid shirt and ripped jeans on board. Your long cardigan loves textures, ribbing, cables and a fuzzy finish, and you’ll appreciate its hoods and pockets (especially if the latter are leather). Give it some gravitas with a faux fur collar! Prints, patterns and stripes abound, although you may prefer not to copy Karl Largerfeld, who walked Gisele Bündchen down the runway in matching striped cardigan, leotard and booties. Team yours instead with skinnies and heels or ankle boots. Match neutrals with darker shades and sunglasses, or be bold with bright accessories in yellow, red and blue. Pair grey with white trousers and pumps, or mix an outfit in our current favourite, monochrome – black jeans with snow-coloured ankle boots, for instance. Wear over a pencil skirt for work, or with cuffed boyfriend jeans at night, but opt for torn denim and a beanie for weekends. Throw the oversize variety over leggings or leather pants, or go for a blanket style, and end with a slouchy scarf, which will also provide a great contrast if slung around a thinner cardigan. The long cardigan might be replaced in your affections one day, but we can’t see it being any day soon. We’re confident that you’ll be in love with this trend for some time yet, so put those outfits together now! Pair your long cardigan with cute white shorts and heels for an effortlessly cool look. Via Megan Anderson. Cardigan: Windsor, Shorts: J Crew, Shoes: Zara. Long cardigans have never been more in style! Maria Vizuete wears this classic cashmere cardi with distressed denim jeans and a plain white tee for a laid back, casual style. Throw on an oversized scarf to recreate this fabulous look. Scarf: Free People, Cardigan: Nordstrom, Bag: Rebecca Minkoff. Ann Taylor has combined a long knitted cardigan with skinny jeans and a classic white blouse to create a cosy but smart fall style which we adore. This look is perfect for everyday wear, and can be dressed up or down depending on which shoes you choose. Cardigan: Acne Studios, Blouse: LOFT, Jeans: Frame, Heels: Jimmy Choo. 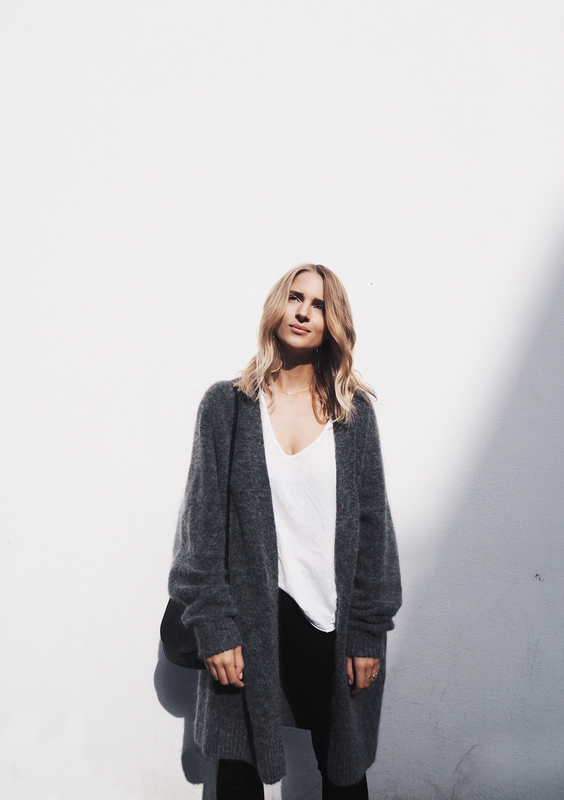 Amber Fillerup Clark debuts a wonderful fall trend here; the long cardigan! Paired with simple jeans and smart leather slip on shoes, this cardigan is cosy, chic, and totally seasonal. We love it! Sweater/Cardigan: Vince, Jeans: 3×1, Shoes: Schutz. The long cardigan trend is perfect for the upcoming winter season. Mónica Sors wears this stylish block coloured cardi with jeans and funky white sneakers. Outfit: Oxygene, Shoes: Just Fab. A long cardigan is the perfect finish to a casual T-shirt and slacks outfit. Via Consuelo Paloma. Cardigan: Vero Moda, Shirt: H&M, Leather Trousers: Zara, Shoes: Superga. 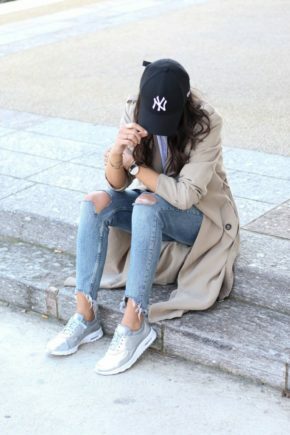 Christine Andrew wears a navy long cardigan with a classic white tee and distressed denim jeans. Cardigan: ILY Couture, Jeans: Nordstrom. Consuelo Paloma wears a cute knitted cardigan with a trendy hat and a pair of open toe leather shoes. Hat: Forever21, Cardigan/Top: Vero Moda. This long marl grey cardigan goes perfectly with a simple white top and black jeans combo. Via Mijaflatau.com. Cardigan: ACNE Studios, White Tee: Bassike. Long cardigans have never looked better. Jessica R. wears hers with a sheer black bodysuit. Pair your long cardigan with simple black jeans and shoes for a casual classic. Via Carodaur.com.